ARTWORK produced by users of the Woking charity LinkAble will be displayed on hoardings around the construction site of the new St Dunstan’s church building. 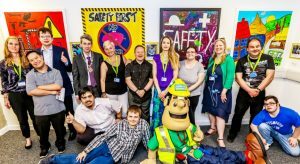 Last week staff and service users from LinkAble, which helps adults and children with learning disabilities in Woking and Surrey Heath, and the Mayor, Will Forster, attended an unveiling ceremony at the site offices of the construction company Galliford Try. The artwork has been entered into the nationwide Ivor Goodsite Hoarding Competition. Now in its sixth year, the competition enables schools and community groups to unleash their artistic skills on site hoardings.